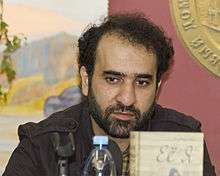 Reza Amirkhani( in Persian : رضا امیرخانی) is a contemporary Iranian novelist. He started writing at high school with "ERMIA" novel. He has studied mechanical engineering at Sharif University of Technology and is a graduate of National Organization for Development of Exceptional Talents; he also writes essays and researches about scientific & social problems. There are also Dastan-e-Sistan and Nasht-e-Nesha written by him that describes some social problems and their solutions.